use the contact us form to register. The term dryland refers to events, training or racing on "DRYLAND" or during the no snow season. Looking at our weather patterns of the past few years, it is no wonder that so many of us in the Midwest are turning our attention to Dryland events. In many other areas dryland is the norm, snow is the exception, so "urban mushing or dryland mushing" is the way to go. Even us in the midwest have more snowfree days than snow covered trails. Your dog will enjoy the year round activities. photo courtesy of Stephan Reginald "The Gear Junkie"
CANICROSS-which is running while your dog is in harness out front and pulling. It can include walk-jor, jog-jor, and run-jor. It is more than loose leash jogging. It is more than jogging with your dog (jogwyd). SCOOTER-JOR or DOG-SCOOTERING-is scootering with one or 2 dogs in harness, out in front, and pulling. CARTS-or CARTJORING (Also known as rigs and gigs) one or more dogs in harness pulling a 3 or more wheeled apparatus. It is essentially dryland mushing. There is also dog sulkies and drafting carts being used by many dog powered sports enthusiast. Start with socialization and some basic obedience work to form a foundation including focus, impulse control, manners and fostering a learning to learn attitude. These foundation skills are key to building a good working relationship. Agility activities can do wonders for confidence and also strengthen the working bond between you and the dog. Swimming is great exercise and a great cool down option as well as a mental diversion, assuming the dog likes water and you introduce him or her to swimming appropriately. Since JOR equates to PULL and these activities are all dog powered sports , pull training (AKA resistance training) is essential to all drafting activities and will help get you started off right. Command Training: is teaching your dogs the commands on foot while you still have control. For everyones' safety, pull training and command training should be done extensively before doing bikejoring or scooterjoring. Canicross is a sport where the dog is attached to you via a towline and skijor/canicross belt. Your dog pulls you as you hike or run. It is typically done with 1 dog. It is great for training as well as conditioning. Good balance is required, Scout the trail 1st, and be aware of who the other trail users are. Scooters and bikes are activities typically done with 1 or 2 dogs. Definitely start out with 1 until you have experience. Scooters and bikes are easier to transport than carts or rigs. Scooters and bikes are similar in concept but yet have definite differences, and your choice is, once again personal preferences. They have different balance points, different center of gravity and do require different riding skills and techniques. Scooters are pretty simple so typically relatively inexpensive and have less to break. Scooters are sometimes referred to as kick-bikes. It is generally quicker and easier to put a scooter into you vehicle than a rig. An advantage of a kickbike or scooter over a cart is the amount of new trails which become accessible, like single track cycle paths(non-paved). Another bonus of the scooter is that it is just a small step down to the safety and security of "terra firma" compared to an impromptu bike dismount. PSA/Safety Tip: Wear protective gear (helmet, knee-pads, gloves, safety glasses). Note: Not all scooters are marketed for (or built for the rigors of) dog use. There is a Low tech and High tech approach and much depends on your riding style or purpose, the dog, and the trails you use. Low Tech has a basic rear wheel coaster brake as well as a handbrake (redundant braking for safety) on a bike frame that is comfortable for you, with whatever seat and handle bars you prefer. High Tech are lightweight, mountain bike technology such as alloy frames, multi-speed, V-brakes or disc brakes and high end suspension systems. Technology offers many obvious advantages but those advantages can quickly be null and void if the bike gets trashed. It is your personal option of attaching to the bike or to a skijor belt, there are pros & cons to both. Note: Dogs need to be thoroughly trained to stay out front and to precisely execute commands prior to using scooters or bikes. The rider/driver should have good balance and be a proficient bicyclist or scooter driver before connecting to a dog. PSA/Safety Tip: Wear protective gear (helmet, knee-pads, gloves, safety glasses, etc). Do not be put off by all the talk of the competitive side of dryland. 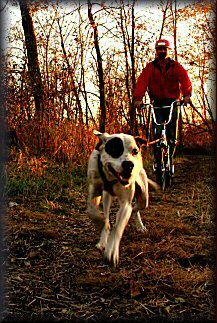 Using a cart, bike, scooter or doing canicross is just as much fun (if not more) in a recreational capacity, it is ideal for going out with one dog for a quick short run during the off season to keep you and your dog in shape and up to speed on commands. Most of the rollerblades and rollerskis are designed for use on pavement or other hard smooth surface which is extremely hard on a pulling dog (foot pads and joints) and is also quite painful to fall on. Most have very low rolling resistance and little or limited braking ability. If you chose to try this option, one should have excellent balance and be very proficient at rollersports itself, before attempting adding a dog to the equation and then should only be attempted with a very, very well trained dog. PSA/Safety Tip: Wear lots of protective gear. Make sure your health insurance coverage is current and stay away from traffic. Personally, I keep inline sports (rollerblading and rollerskiing) separate from dog training. Carts and Rigs are available commercially or home built, in various styles, sizes, weights, and designs. Cart design, weight, tire size, tire type, suspension, brake types, trail surface and conditions all effect handling, stability, rolling resistance as well as stopping and holding power. These cart attributes and trail conditions also dictate the number of dogs that may be safely used on a cart. This can vary with dogs, trails, and of course training. Carts can be good training tools as well as for exercise and conditioning. Many designs allow easier co-training as 2 people can ride the cart. Many carts allow you to stop, set a parking brake, and then proceed with confidence to position the dog for success in command training. This a HUGE benefit and aid to training. It also allows you take rest breaks, give treats or water, cool down, and give praise and encouragement. A snub line can be used as a back up for the parking brake (as a light cart can still be dragged with a parking brake set). There is no perfect rig other than the one that best fits "your" needs and uses. Some are folding for easier transport; a few come apart for transport. For rigs that use wheelbarrow tires, the tires can be replaced (when needed) by a trailer tire which will fit on the wheelbarrow rim and hopefully still have enough clearance for the friction/scrub brake which many use, reason: the trailer tire is far more durable. On 3 wheel carts, many claim you can carry gear, passengers, or weight up front, Note: that this will effect steering and handling. A passenger/helper riding the rear deck has less impact on handling than riding up front.